Ask an aviation enthusiast which piston powered trainer could out-climb and out-turn a P-51 Mustang. You’d probably get puzzled looks in return. Then go on and give them a hint that the same trainer took part in armed conflicts around the world over two decades, one pilot flying more than five thousand missions in the aircraft. A trick question? Not at all. This is the North American T-28 Trojan. This advanced trainer replaced the legendary T-6 Texan, or Harvard, starting in 1950. The US Navy kept the aircraft in service up until 1982, attesting to its outstanding qualities. When the U.S. Air Force was set to replace its fleet of advanced training aircraft after WWII, the winner of the evaluation process was once more a design from North American Aviation. NAA had secured themselves a central position in aviation history by designing and building famous aircraft like the P-51 Mustang fighter, the B-25 Mitchell bomber and arguably the most famous training aircraft ever, the T-6 Texan (or Harvard as it was known in British Commonwealth). The T-28A, chosen by the US Air Force in 1950, following an extensive test program. The aircraft was designed to replicate the characteristics of contemporary jet fighters as closely as possible. Thus, it was equipped with a tricycle undercarriage, and the cockpit layout and workflow closely resembled an F-86 Sabre. The engine initially selected and used in the A-model was an 800 horsepower Wright R-1300. 266 A-models were built, and the USAF used the aircraft from 1950 until 1956. When time came for the US Navy to renew their advanced trainer fleet, it was decided to go for a more powerful engine. This led to the T-28B powered by a 1425 horsepower Wright R-1820, leading to dramatic improvements in performance. The aircraft also gained weight, leading to flight characteristics more closely resembling a heavier jet fighter. A speed brake was added. The Navy also had a requirement to use the aircraft on carriers, leading to the tailhook equipped T-28C. In order to provide better ground clearance during rough deck landings, the C-model used a propeller with somewhat lower diameter, leading to slightly reduced performance. 489 B-models and 299 C-models were delivered. The US Navy used the aircraft until 1982, an impressive service life. During the various conflicts in South East Asia, the T-28 proved to be an ideal aircraft for close air support. The US Air Force as well as friendly countries in the region flew the aircraft. In addition to B-models and C-models stripped of the tailhook, the T-28D was developed for use in these conflicts. The D carried various under-wing weapon loads, and were usually converted surplus A-models that were equipped with the big engine. The T-28 was used with impressive results in the region, but most of the operations received little public attention due to their clandestine nature, often with extensive CIA involvement. Most noteworthy were the operations in Laos. One of the Lao Hmong pilots flew more than 5000 missions in the T-28. France also converted A-models using the R-1820 engine. They named it the Fennec, and it was used as a trainer as well in the war in Algeria. After ending its military career, the T-28 Trojan has become a popular warbird under civilian ownership. It delivers fighter performance combined with benign and delightful flight characteristics. Compared to the WWII aircraft, the onboard systems are more complex, but the Trojan is very maintenance friendly with all areas easily reachable through access panels. Behind the engine, there’s even a permanently installed step-ladder and working light, and the firewall is removed with a few quick release fasteners, giving full access to the rear portion of the engine. Handling is delightful. Ailerons are light and produce a very healthy roll rate, certainly much better than a P-51. Aerobatics are wonderful, and the aircraft begs for it. Stalls are straight ahead, and ground handling easy with the tricycle gear. Even if not quite as fast as most of the WWII fighters, performance in general is impressive. At low weights it climbs close to 4000 feet per minute. Never-exceed speed is 340 knots. Cruise can vary according to preferred fuel consumption, but a typical number is 180 knots indicated airspeed while consuming about 45 gallons per hour. Going faster dramatically increases consumption. Using the on-board oxygen system and flying high, fairly good true airspeeds can be attained. Service ceiling is 35000 feet. The cockpit feels great. It’s well organized, roomy, and almost everything is duplicated in the rear seat. The hydraulically operated canopy certainly is cool. All things considered, the Trojan is hard to beat if you’re looking for a high performance two-seat piston powered aircraft with fantastic handling, great engineering and an exciting history. Motor: Wright R-1820-86 Cyclone 9-Cylindret radial engine with 1425 Hk. 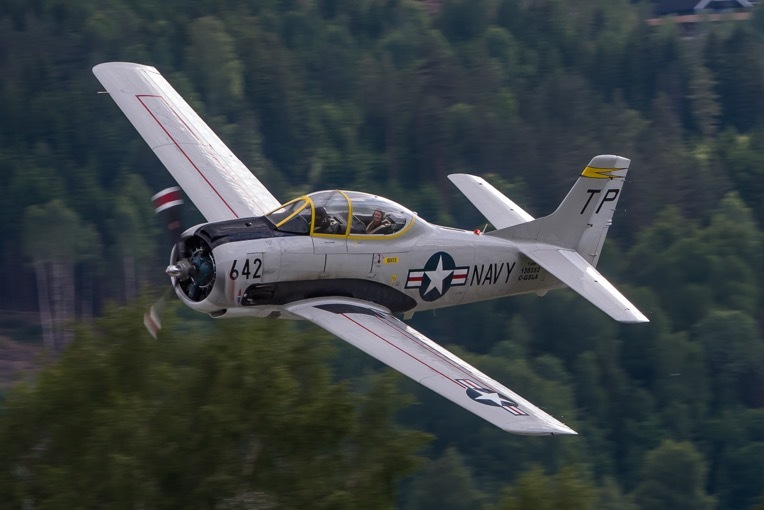 The aircraft is a North American T-28B with manufacturers construction number c/n 200-423, US Navy Bureau Number 138352. It was built in 1955. The aircraft was initially delivered to the US Navy. We don’t know any particulars of its history during this period, but it presumably flew as a trainer alongside many other Navy T-28’s. It was struck off charge from the US Navy on January 11th 1962, assigned to the Military Assistance Program [MAP] and delivered to the South Vietnamese Air Force. It was assigned to the 2nd Fighter Squadron, redesignated 516th Fighter Squadron in January 1963. In June 1964, it was transferred to the Royal Lao Air Force and used by Detachment 6, 1st Air Commando Wing, codenamed operation Waterpump. This was a was a secretive support operation by the U.S. Air Force to train and nurture into existence the Royal Lao Air Force in order to help fencing off a North Vietnamese invasion. In addition to Lao Hmong pilots, the unit also trained Thai mercenaries and US civilian pilots from CIA controlled Air America. In March 1968, a forward air control operation named Raven FAC’s was formed in Laos. Also known as the Steve Canyon program, named after a comic strip adventurer and pilot, candidates for the program were experienced FAC’s given the option to volunteer for a special program with no knowledge of their destination. They were forwarded to the American Embassy, Vientiane, Laos. There they were stripped of all military identification and gear, supplied with U.S. Aid identification, and changed into civilian clothing to be worn for their entire tour of duty. The screening system tended to select experienced and aggressive Forward Air Controllers who were not very amenable to being restricted by regulations. The covert operation in Laos involved using American pilots with Lao observers/interpreters in the rear seat. The aircraft used were mainly the Cessna O-1Bird Dog and the T-28 Trojan. The risky mission involved directing air strikes and marking targets with rockets. There was always a shortage of pilots, and casualty rates were high, around 50%. Flying more than 10 hours in a day was not unusual. One Raven calculated that 90% of the Raven planes had been hit by ground fire during their tours of duty and that 60% had been downed by enemy action at some point. Even with the high losses, the T-28 proved to be a very effective aircraft in this role. Our T-28 was flown by Raven Ed Gunter out of Luang Prabang (base code L-54) between November 1969 and January 1970. The history after Gunter flew the aircraft is not known in detail, but records indicate it was maintained for the RLAF by Air America at Udorn, Thailand until June 1973. The aircraft was transferred to the Philippine Air Force with tail number 53-138352 around 1976 probably for use as spare parts. It was dismantled at Vilamor AB during the period from 1980 to 1988. The aircraft was sold in March 1989 to a customer in Oregon and was registered as N20523 in September 1989. The registration was cancelled in March 1995, and the aircraft was exported to Canada. It received Canadian registration C-GSLA in May 1996 and received a very thorough ground-up restoration by Serge Lacombe, Mascouche, Quebec. Dietmar Zschogner in Parry Sound, Ontario bought the aircraft in 2015. This is one of the finest T-28 restorations in existence today. In 2017 the aircraft was sold to Norwegian Flying Aces as part of its historic aircraft collection and based at Notodden airport.